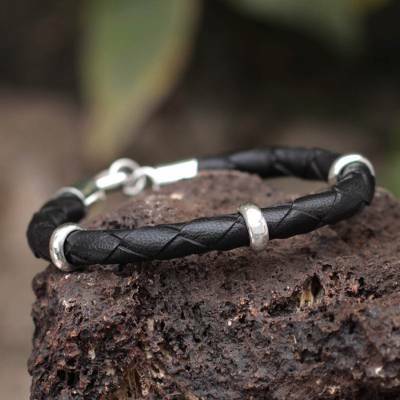 You can find men's leather braided bracelet 'Bold Black' by Rosa Tomatis in jewelry categories such as No Stone Bracelets, Silver Bracelets, Sterling Silver Bracelets, Leather Bracelets, Braided Bracelets and Wristband Bracelets. Enjoy exploring these sections for other Novica treasures. Rosa Tomatis has received 2 microcredit loans with 0% interest from Kiva and Novica, the first for $2050 and the most recent for $2050. Proceeds were used to purchase quality leather and silver for production. "I feel a need to express something, and this is what motivates me to paint. My canvases and monotypes show scenes of light – clean and floating like a dance of life." Rosa Tomatis was born in Lima on August 7, 1948. She studied in a number of art workshops that were especially valuable for the function of design. Her artistic formation was achieved in the Universidad Católica, while her paintings are inclined toward the surreal and playful abstraction. "When I was very young, my family saw my natural instinct for drawing, so they found an art teacher for me. Thus I followed this path, and I found it more and more beautiful," Tomatis says. "When I was a little girl, I loved to hear stories. But I always asked that they be in color. When they had a sad ending, I'd insist it be changed to a happy one. That was many years ago. But when I hear a sad tale, I still want to change it to have a happy ending. "I'm a painter but as a girl I learned all about leather, as my father worked with tanners. My brother Rodolfo Tomatis is also a Novica featured artisan [with leather handbags]. I design and work with leather, and I also craft jewelry. With both, I select the very best materials. I love to mix natural elements with silver. Sometimes I give it a rustic finish; other times I like a shiny surface. "I feel a need to express something, and this is what motivates me to paint. My canvases and monotypes show scenes of light – clean and floating like a dance of life. I'd love to be able to reach you with my work – feel that somehow my message reaches you – and share it with everyone." Tomatis has shown her work widely thoughout Peru, the United States, Germany and Italy, and her works appear in many collections worldwide. The artist has an eye for mixing beautiful materials to produce classic, understated bracelets, which have a feel of quality and longevity. Very special work by very special talent. Thank-you. Rosa, I'm so very pleased with the bracelet you had designed & made. I couldn't have ask for more.You are one talented lady. Keep up the good work. I hope to purchase more items from you. Thank you so much!! I bought the ""Red Furrows"" men's leather bracelet from this artist. It is pricey, but worth the money spent. Despatch was timely and packaging protected the content very well. Wrapping was suitable for both own use or gifting to someone else. Sizing of the wristband is large, but was just not too large to become un-wearable. Materials used are beautiful to look at and touch, and I hope they'll stand the test of time. If I may make a suggestion, Rosa, it is that you specify the diameter of your wristband or provide alternative sizing for those preferring a tighter fit. Gracias.